Comments: Part of the intro of ‘Boiler’ and ‘Take A Look Around’ from the bridge onwards are cut as well as cuts between songs. Uploaded on YouTube one day after. Master files are uncirculated. – Fred went into the crowd during the bridge of ‘Livin’ It Up’ and stayed there until the end of the song. – Fred mentions that it’s Sam’s birthday before ‘It’ll Be OK’. 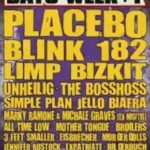 – Fred mentions the first show the band played at the festival almost exactly ten years ago before ‘My Way’. – Sam and Wes jammed ‘Stuck’ until the first verse before ‘Break Stuff’. – Fred didn’t scream the last chorus of ‘Walking Away’. Instead, he sang the last chorus for the first time. – Fred went into the back of the venue after ‘Eat You Alive’ to perform ‘Behind Blue Eyes’ (The Who cover) from there. After the song, he went to the bar and stopped there to get a beer before he got back on stage. – The band headlined day 1 of 3. 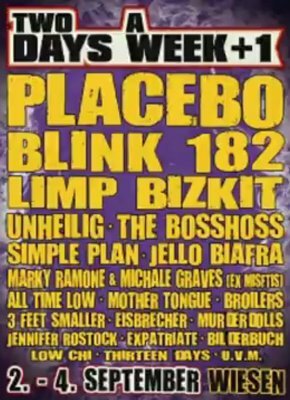 – This was the second time that the band played the festival after 2000.